Paolo Veronese (ital. 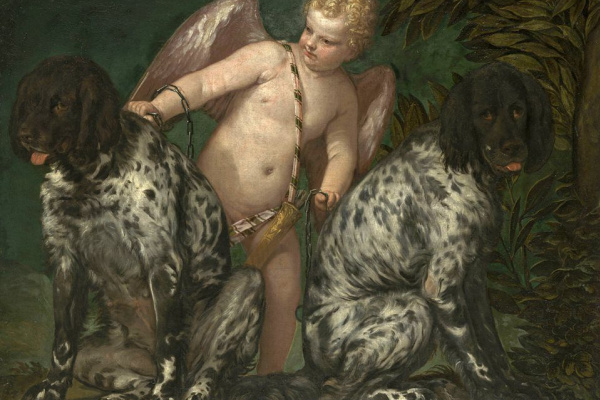 Paolo Veronese), one of the best artists of the Venetian school, born in Verona in 1528. The real name of the artist — Cagliari, and the name of his native city was subsequently selected by the painter as the alias. Paolo was the fifth of the sons of the sculptor and stonemason Gabriel Cagliari. Creativity to some extent was common to many members of the family: painting the future artist studied with his uncle, Antonio Badile. He was not a great master of his time, but was able to instill in the boy a love for art and helped him to discover the talent of the artist. 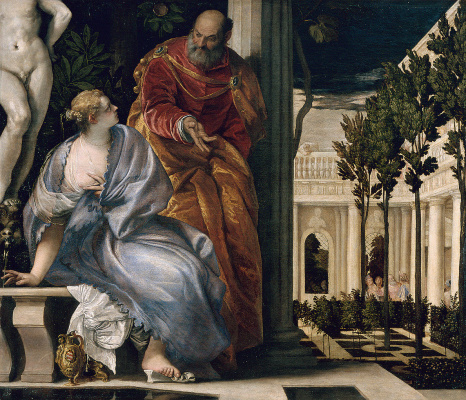 Daughter Antonio, Elena, in 1566, married a Veronese married. Works in the genre of monumental and decorative painting, in which Paolo did in his youth to the end of his life, brought him fame at the age of 25 years. Works of the painter distinguished by the ease of execution and colouring, characteristic of the painting school of Verona. In addition, it should be noted that the images created by the artist Veronese for pictures on the Gospels, was quite brave for its time. Because of his freethinking Paolo was even subjected to the judgment of the Inquisition, but was acquitted. It is only obliged to correct a few disputed content of the paintings. Family life Paolo went well: he was happily married and surrounded by children. In 1583 a talented painter, tired of the cares and labors, he acquired the estate, which had planned to spend a quiet and peaceful old age. However, just a few years of serious illness brought him to the grave. He died from pneumonia in 1588 in Venice. 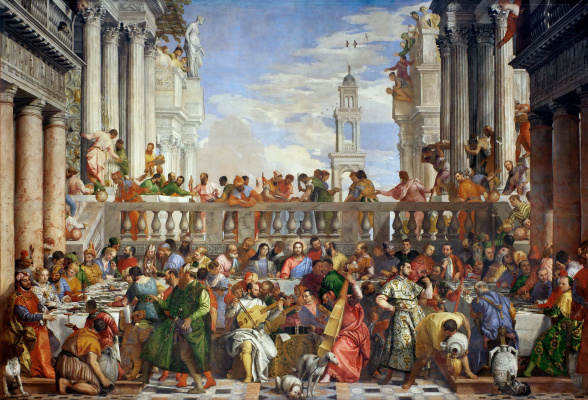 Features of the artist Veronesein the works of an artist successfully combined the best of what can be learned from the influence of Veronese and Raphael schools of painting. Gorgeous color, freedom and daring ideas and implementation of creative ideas, the elegance and lightness of the picture — it is characteristic for the works of Paolo. 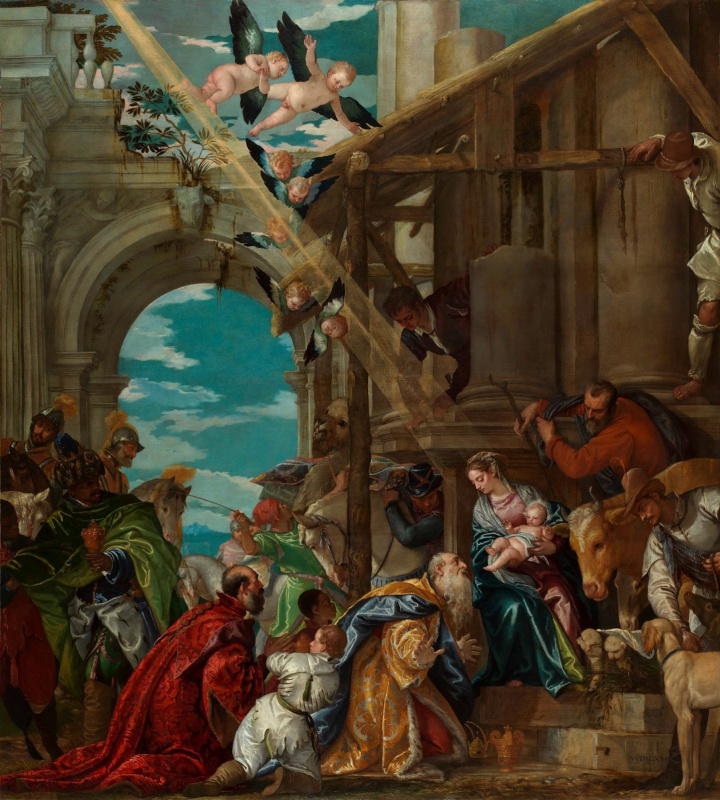 It is interesting that in the paintings of biblical themes, Veronese used a kind reception. The characters in his paintings appear in the background of the modern artist Veronese interiors, dressed in costumes of the time. Innovation of the painter in technical terms can be called that when painting, for example, ceilings Paolo took into account the visual distortion of objects. He skillfully applied in the work of unexpected angles and spatial reduction for the correct perception of the image by the audience. 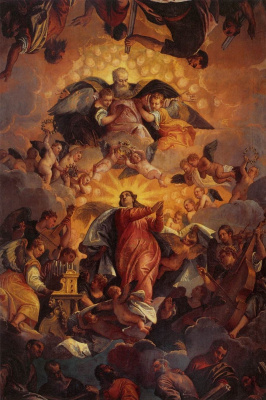 Reception, creating the illusion of floating in the air figures: subsequently it was widely used by the masters of Baroque painting. 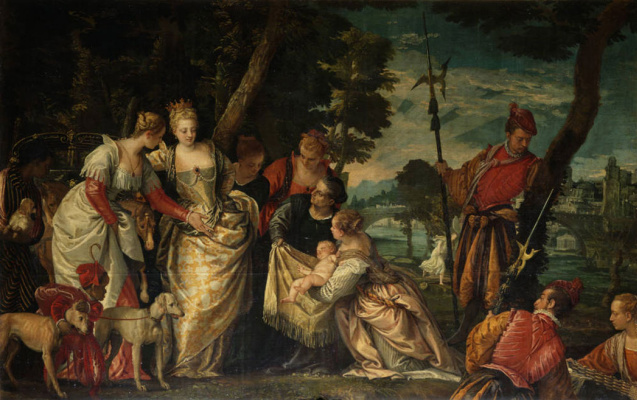 The famous painting by Paolo Veronese"The repose on the flight into Egypt", "Mars and Venus", "Feast in the house of Levi"and "The marriage in Cana of Galilee". Work in the Doge’s Palace, the Church of San Sebastiano and the library of San Marco made a splash at the time, and brought the artist fame in the widest circles. The end of the 60-ies of the XVI century — the heyday of the skill of the painter. By this time, he became known not only in Venice but also abroad. Large orders were received in large numbers. 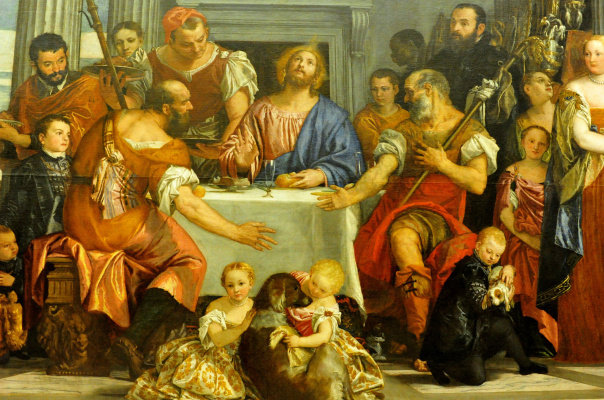 The art of Veronese as a brilliant decorator reached their peaks he is often invited to paint the palaces and villas. Largely its popularity is due to the fact that Paolo was the first artist who thought about the compliance of their works to the architectural features of the buildings. Working in the fresco technique, it is with great taste and skill has placed his paintings in the interior. Because of this, painting and architecture perfectly complemented each other and looked like a unified whole. 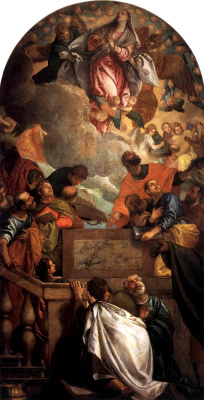 Almost all the paintings of Paolo Veronese, even the ones that were written based on the gospel stories, wore emphasized a secular nature. The paintings reflect all the pomp and circumstance of modern Venice: the luxury of the feasts, the costumes, the passion of the Venetians for the holidays and fun. However, the sincere sympathy of the painter to all of this and his active talent had nearly cost him his life. A significant portion of orders received artist from various religious organizations. He painted the Church of St. Sebastian, monastery of San Giorgio Maggiore. His work has adorned the refectory of the monastery Santa Maria dei Servi. 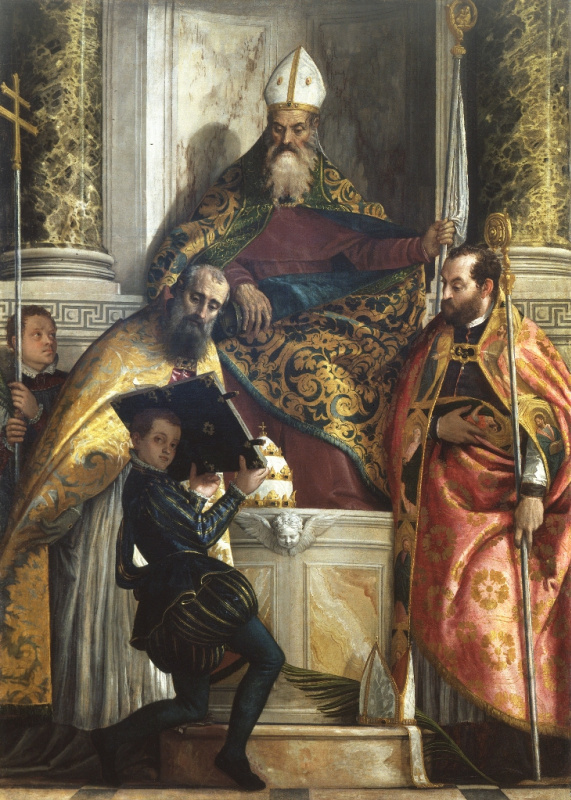 In 1573 Veronese was commissioned by the Church of Santi Giovanni e Paolo — one of the most famous and biggest cathedrals of Venice. Two years earlier there was a fire, which killed "the last supper" by Titian. 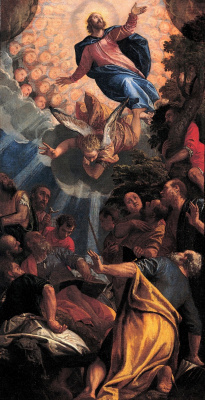 Veronese was commissioned to paint a canvas with a similar name and plot. A free adaptation of the story — the image in the picture of soldiers, children, dwarfs and animals — angered the Church. A few months after receiving the painting Paolo Veronese the painter of monks was summoned to the Tribunal, demanding an explanation. Paolo managed to avoid a trial only because of his wit and the promise to correct the scandalous work in accordance with the gospel. However, the picture was not subject to significant alterations: the artist just changed the name and added a few explanatory phrases on the canvas. Now picture, once caused a serious stir is in the gallery of the Venetian Academy. In the XVIII century it was badly damaged during a fire, and only fully restored in 1827. In the last years of his life, the artist departed from the creation of the magnificent decorative paintings. To replace the decorated paintings on the holiday feasts and the life of rich citizens, come restrained in mood and even tragic the plot of a work. The change in the work partly explain what happened in the mid 70-ies tragic events in Venice: the fires and the plague. 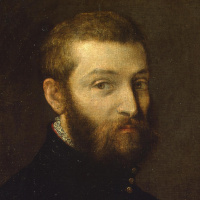 For several years, Paolo Veronese lost people close to him, among whom were Titian, Palladio and Daniele Barbaro. In addition, at the end of the XVI century the art declined. The Venetian painters of the longest resisted the ideas of mannerism, which spread everywhere, however, and their work began to show the traits of this trend. 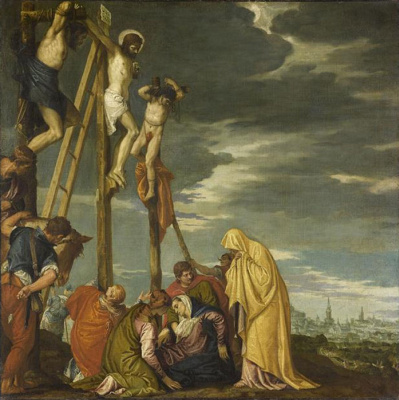 At this time, the artist has painted a series of paintings with religious content, including "Lamentation of Christ", "Crucifixion" and "Resurrection." Numerous works of this period, describing the lives of the saints, were well received by the Church: her painter was all support. In later works by Veronese shines through the melancholy and suppressed anxiety, grief and disappointment. However, not all the wizard created in the 80-ies, so sad. In 1585, Paolo Veronese created one of his most grandiose and solemn works: "the Triumph of Venice." Painting the ceiling in Doge’s Palace, full of allegories and symbols, impresses the audience with its splendor, beauty and cold hill images.